Mugwort has a history of being used in magic ritual, as well as medicinal application. Always a blessing to have this herb around! 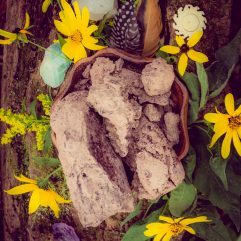 We are now offering Charcoal Tablets to use for burning our Ritual & Ceremony herbs. You can buy a single Roll on the drop-down menu of this plant, or check the link to buy in bulk! Mugwort possesses Oneirogenic properties (Dream Enhancing), and was traditionally smoked or consumed in teas. Very Very small quantities were used generally as compared to other medicinal herbs, Mugwort is quite potent in its action so please be responsible and careful in your meeting with it. 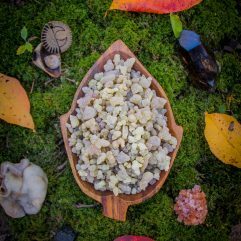 This herbal has a rich history of traditional uses all over the world, from ritualistic and spiritual, to magical and medicinal! In China it has been used in moxibustion, which is an acupuncture treatment meant help a breech baby turn in the womb. Mugwort would also be hung in doorways to ward off the evil spirits of sickness. In Europe Mugwort was used by those said to have practiced magic, as well as by most as a symbol of protection to ward off evil spirits, protect from possession, and protect travelers from sickness. Mugwort was also used in Europe as an agricultural food source for animals and in the preparation of ale before hops were widely used. Roman soldiers were said to put Mugwort into their sandals to reduce fatigue during long marches. 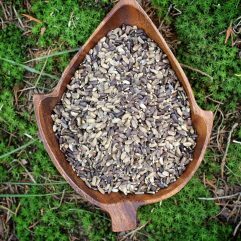 In North America Mugwort has been used by Native Americans to induce menstrual flow and regulate menstrual cycles, as well as a protective symbol. The spiritual uses of Mugwort are very interesting considering that the concept of protection is shared among many cultures. Mugwort is also known to many cultures as a dream inducing and traveling herb. Some would burn it as incense to induce trance states and help with astral projection. Others would use the smoke or make a tea to induce lucid dreaming. In fact Mugwort is said to be such a powerful dream herb that it was once even common to put it into pillow linings to gain the lucid dreaming effects! As a medicinal Mugwort has a wide list of uses, and is frequently made into oils and extracts. Making a tea from Mugwort is also a great way to make use of its healing properties. 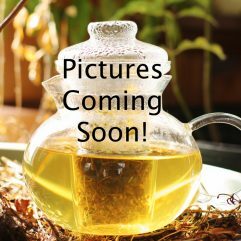 Mugwort tea can be used to treat stomach pains, digestive issues, to dispel parasites, upper respiratory ailments, nervous disorders, as a diuretic, to induce appetite, as a mild sedetive, as an oneirogenic, and to stimulate menstrual flow. Mugwort can also be used to make a topical balm or poultice. Topically, a Mugwort balm can make a great bug repellent, and pain reliever for skin irritations, rashes, arthritis, and rheumatism. We hope that Mugwort’s spiritual and medicinal energies can be as much of a blessing for you as it has been for us! Mugwort is a very powerful magical herb. 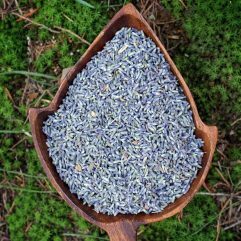 I like to occasionally add a pinch to my favorite herbal brew and smoke blends for an extra energetic kick, and I also keep a small pouch of it under my pillow to act as a dream enhancer. The quality of the product sold here is great; very powerfully fragrant and obviously treated right. Shipped really quickely. Got little more than I’ve ordered. Very good quality and very nice dreams ! 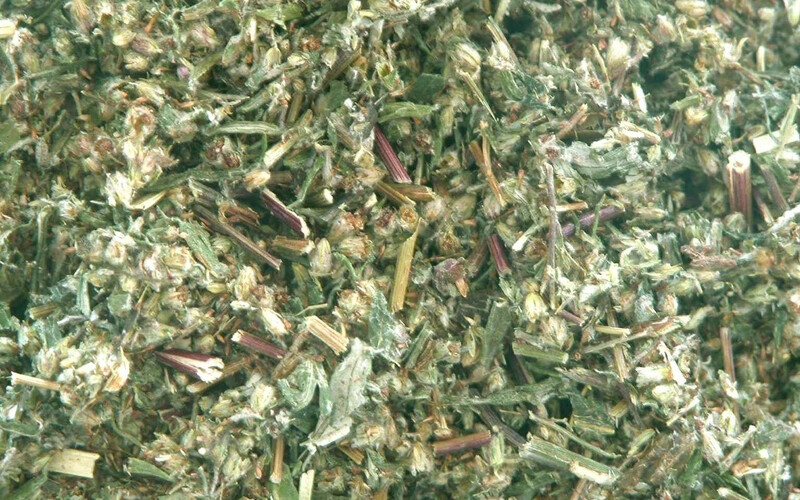 This mugwort along with the indian warrior flower buds have been mine and all of my friends favorite smoke blend. It is super relaxing and is going a lot faster than I expected. I tried to make a tea out of it and it was really earthy hehe a little too earthy for me. So I will just stick to the smoke for now! One of my favorites forsure 🙂 thanks Eternity!